PUEBLO – The Student Recreation Center (SRC) at Colorado State University-Pueblo again will offer a Multi-Sport & Adventure Camp this summer for children entering grades K-5 and 6-8. Camps will be held at the SRC at CSU-Pueblo from 7:30 a.m.-5:30 p.m. Mondays through Fridays. Half day sessions also are available from 7:30 a.m.-noon or noon-5:30 p.m. Participants will enjoy a variety of sports and adventure activities with an emphasis on FUN, learning, and participation. Six sessions will be offered throughout the summer during the following weeks: June 4-8, June 11-15, June 18-22, June 25-29, July 9-13, and July 16-20. Each day will consist of a variety of recreational experiences in short increments to ensure active participation among campers. Children will rotate stations and be taught and monitored closely by background checked and vetted camp counselors. Campers are required to provide their own sack lunches and snacks. The combination of competitive prices, flexible schedules, state-of-the-art facilities, and enthusiastic staff will keep you and your child happy this summer. K-5 campers will participate in on-campus activities such as: basketball, crafts, climbing, swimming, biking, zipline & challenge course. Campers in grades 6-8 will participate in those activities as well as leadership development opportunities and field trips to Lake Pueblo, various trail systems in Colorado Springs, and Beulah Mountain Park. New this summer is a capacity limit for each age group to better serve campers with appropriate staffing numbers. Daily max capacities are 30 campers for each age group, K-1st grade, 2nd-3rd grade, 4th-5th grade, and 6th-8th grade. The camp is asking for donations to contribute to a camp scholarship fund. These donations may be made in the amounts of $5, $10, $20, $50 and $100 via the camp’s website. This money will be utilized to provide financial assistance to those who qualify. 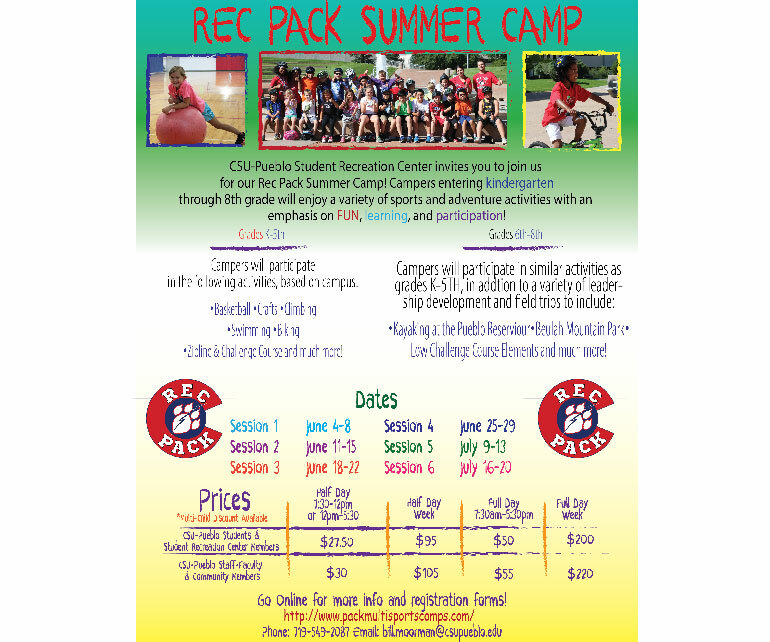 All registration forms and additional information for the camp are available at www.packmultisportscamps.com. For questions, more information, or to register, contact bill.moorman@csupueblo.edu or call 719-549-2087.